Now that the first planned California High Speed Rail (HSR) segment will go from Merced to Palmdale, we analyze the implications of having "enhanced" speed tracks rather than high speed tracks in Northern California. Enhanced speed tracks will allow trains to travel from 75 to 90 miles per hour (mph) as opposed to high speed tracks for speeds of 150-200 mph. 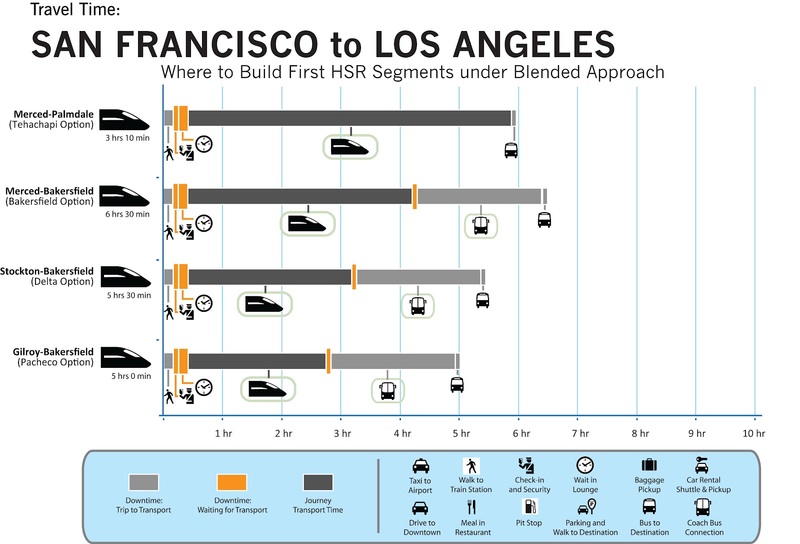 In Part 1 of the High Low Speed Rail Tango (HLSRT) we looked at the Blended Plan overall, while Part 2 examined HSR travel times compared to driving and flying. In Part 3 we will have a final look at alternatives to the blended plan, examining the alternative travel times. 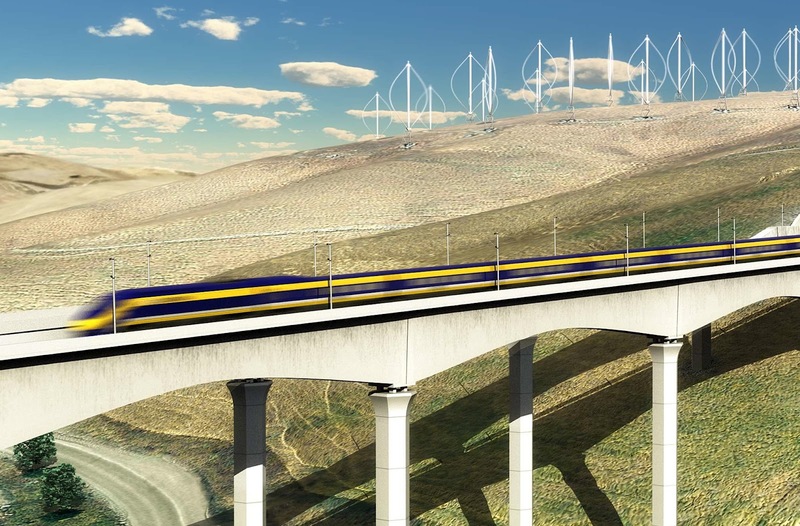 Firstly, and more importantly, we look at how trains will reach the Bay Area now that the Bay Area will not see HSR tracks for decades due to the selection of the Tehachapi segment (Merced to Palmdale) to be first constructed. What the Bay Area will see is HSR trains; actual sleek fast modern looking high speed trains with electric caternary systems to connect to electric wires. The questions is how trains will enter the Bay Area without using the Pacheco Pass route. Secondarily, what service routes will be selected and which are optimal to the overall Bay Area needs, but also work with scheduling and political pressures. HSR High Speed Rail. HSR describes the overal service and infrastructure. Both the special tracks and overhead wires that support high speed tracks, the HSR train vehicles, and stations that service HSR trains. HSR Trains HSR trains are the actual train sets or train vehicles that go at high and low speeds. Vehicles include locomotives, passenger cars and specialty cars such as cafe cars or other services such as mail cars. HSR Service Includes scheduled routes and associated stops. E.g. 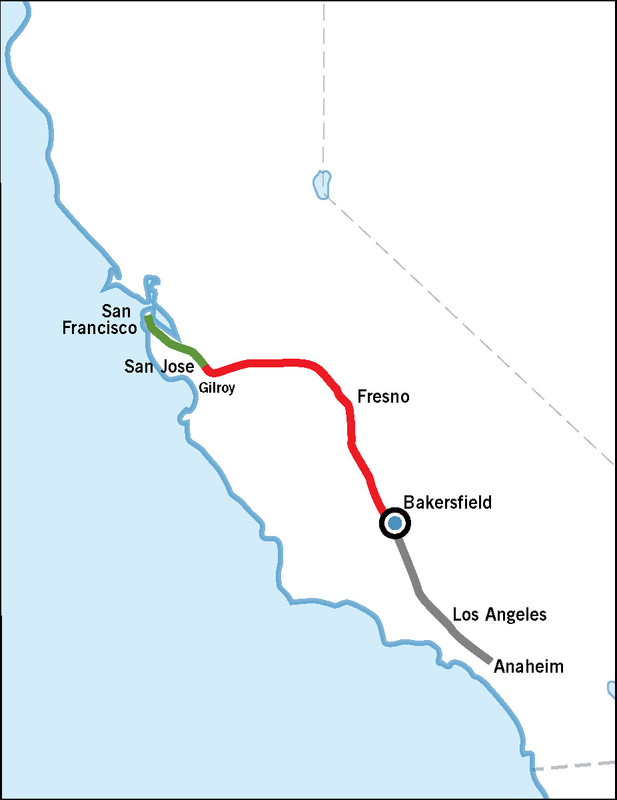 The current San Joaquin train runs from Oakland to Bakersfield with coach bus service on to Los Angeles. 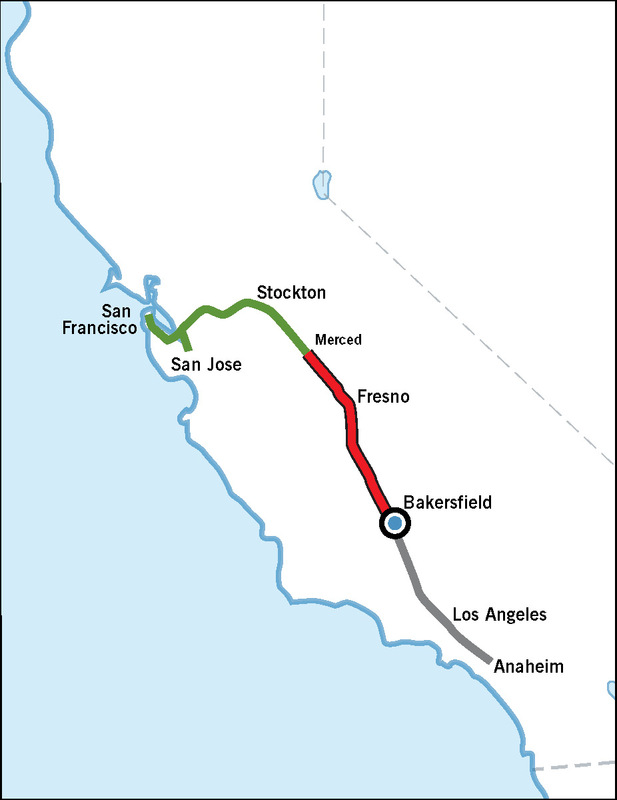 The train route and the coach bus route are the overall service for the San Joaquin train. If a train is express it will not make all the stops along a route, but a local train makes all station stops. Under all of the the options described below, it is assumed that high speed train sets would travel the entire distance from the Bay Area to Los Angeles. Although only traveling at high speed from Merced to Palmdale, the trains would travel at "enhanced" speeds of between 75 and 100 mph between the Bay Area to Merced, and from Palmdale to Los Angeles. To achieve this upgrade to tracks between Merced and the Bay Area are required as the plan describes. The major question is where to make those improvements, especially for achieving a one seat ride between California's two larges metropolises. If the train route were selected today, and only moderate upgrades were made to existing rail corridors as proposed in the Revised 2012 Business Plan, Altamont Pass would likely be the choice for entering the Bay Area. If upgrading rail on the the San Francisco Peninsula to 90 mph speeds were deemed too high and/or opposition to such upgrades were strongly fought by locals, HSR train service might terminate in San Jose. Such a scenario would require passengers originating in San Francisco to take the Caltrain commuter train down to San Jose Diridon Station. There they would disembark and board an HSR train vehicle which would travel all the way to Los Angeles. Some may say this scenario is unlikely or even illegal because Proposition 1A required the initial HSR service to be between San Francisco and Los Angeles. However, when considering political opposition to HSR trains on the Peninsula, and likely fiscal restrictions on construction, this option could end up happening. Some HSR trains could start in San Francisco and pass through San Jose. However this would require the train to backtrack in "Y" turnaround in San Jose (not shown in map) requiring a longer stopover in San Jose, further lengthening the journey time. (A "Y" turnaround here would be similar to the same maneuver performed at trains passing from through San Francisco Int'l Airport instead of terminating there.) Even if some trains did travel from San Francisco to San Jose, under this scenario, there would be very few, while most HSR trains would start in San Jose. 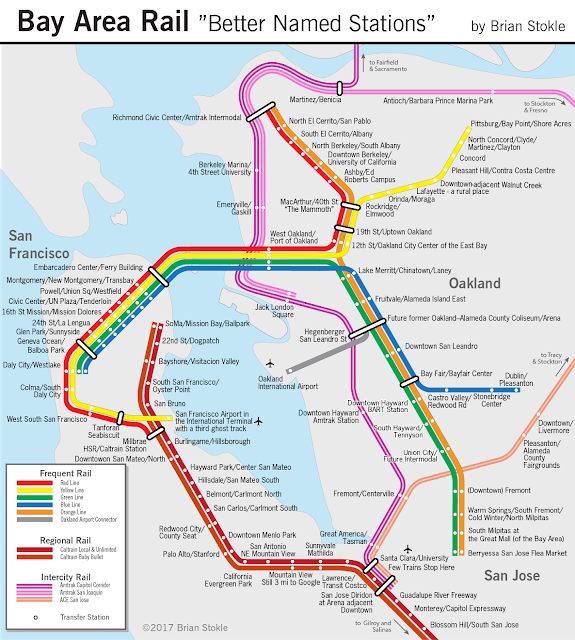 The San Francisco via Caltrain option would only become viable if Caltrain offered "connecting" service to HSR scheduled routes. Such service should include luggage services, a short layover in San Jose (~10-15 minutes depending on the distance between trains), and special train cars dedicated to HSR passengers. Cars might be specially appointed with higher quality seating, and more services, while a simpler version would simply have a dedicated car or two for HSR passengers that would not be accessible to regular commuter rail passengers. Even if "connected" comfortable service were offered on Caltrain, the need to change trains would likely discourage many potential passengers. Instead, this scenario might have headlines reading, "Silicon Valley steals 49ers, now they steal HSR". Joking aside, without HSR directly accessing the largest office district in the Bay Area would be a major misstep, and would not bring many of the touted benefits, both economical or environmental to the overall Bay Area. The Delta Option would possibly be even cheaper than the San Jose Caltrain option. Upgrades from Stockton to Martinez could be make over this largely flat land. The route from Martinez to Richmond is more circuitous. Although it could be upgraded, it would only achieve higher speeds if trains could tilt like the Acela. An alternative would have new tracks, including bridges and tunnels, built along Franklin Canyon from Martinez to Hercules following the BNSF alignment. Closer to San Jose, an alternative route starting in Fremont could follow existing freight alignments just east of I-880 and into Diridon Station. Such a routes could be straighter and save some time, but would be more costly, and may have environmental challenges. 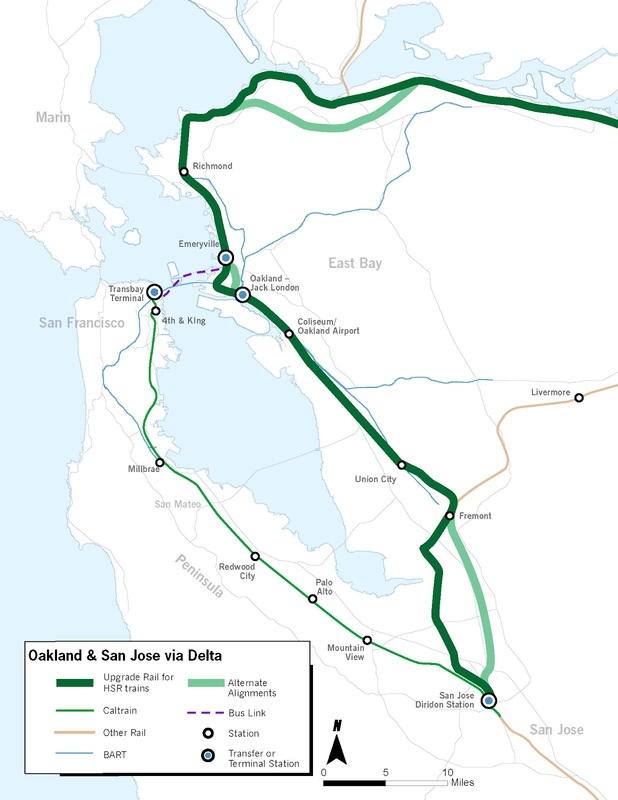 The bigger challenge comes from a required bus connection to San Francisco, similar to current Amtrak services, and the need for more trains along this corridor which is already congested and has limited capacity from Oakland to San Jose. In addition, travel time to San Jose would be slightly longer due to passing to north via the Delta and looping south to San Jose. 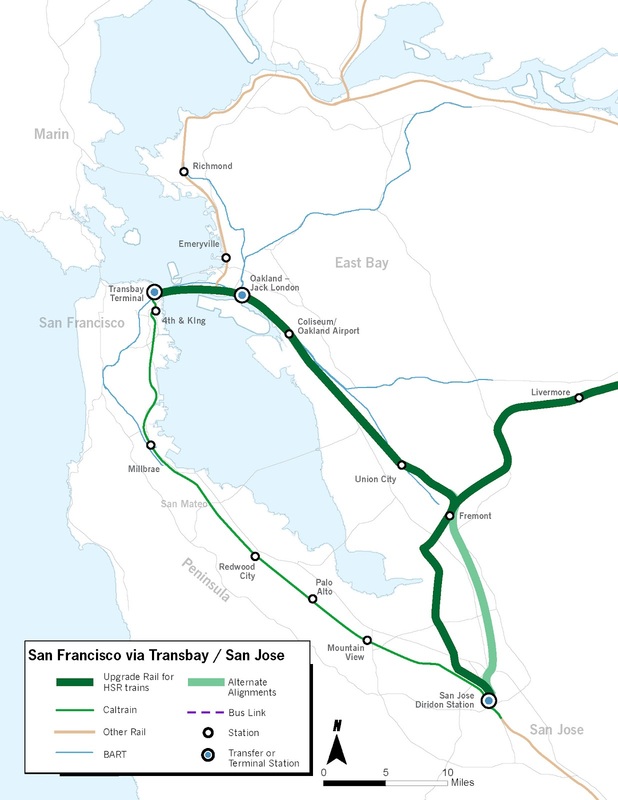 Similar to the "Way to San Jose" option, trains would enter the Bay Area via Altamont Pass but service would branch between San Jose and Oakland or Emeryville. Passengers destined for San Francisco would take a bus across the Bay Bridge from Oakland to the Transbay Terminal. By providing near direct service to San Francisco, via a short 15 minute bus link from Oakland, this option is more attractive than the San Francisco via San Jose and Caltrain option. Although they both require a transfer (HSR train-to-Caltrain from San Jose vs. HSR train-to-coach bus from Oakland), the Oakland option allows for a direct service to San Francisco with several advantages. Coach buses would offer luggage services and comfortable coach seating, along with the short 15 minute ride time . In contrast, transfers in San Jose to Caltrain would require an additional 40-50 minute journey to San Francisco. Traveling on a commuter train, although more comfortable than a subway, would less likely have luggage services, less comfortable seating and higher chance of crowding than dedicated buses from Oakland to San Francisco. Branching service has its advantages and disadvantages. As described by Human Transit, branching divides frequency of scheduled train service. Although more critical in urban transit, the same challenges can plague a long distance rail system like California HSR if it reaches capacity. In action the map below would mean half the trains from Los Angeles would terminate in San Jose and the other half in Oakland. If the we presume 6 trains per hour, 3 would go to San Jose with possible stops in Livermore and Fremont, while 3 trains bound for Oakland might make stops in Livermore, Union City, and Emeryville. If demand increases, and the tracks can support 10 trains per hour, then 4 more trains could be added. However if only 6 trains per hour are feasible service cannot be increased. Oakland to San Francisco coach bus service, although comfortable and relatively short would be vulnerable to Bay Bridge traffic. Access from Oakland to San Francisco is relatively reliable and quick due to buses jumping the queue at the Toll Plaza, and reaching the Transbay Terminal via direct aerial ramps that avoid mixing with San Francisco street traffic and stop lights. Access from San Francisco to Oakland is more problematic if traffic is slow on the Bay Bridge due to not have metering lights or a toll plaza that controls flow onto the bridge. The new Transbay Terminal ramps will allow easy access to and from the terminal avoiding street traffic. In addition, most of the traffic approaching the bridge in San Francisco is either on the streets of SOMA or on the I-80 eastbound approach. Because the bus ramps enter the bridge on an exclusive lane, delays for buses will be less frequent. The Dumbarton Option would allow trains to directly reach San Francisco and San Jose. However, much like the East Bay Branching Option, service would branch between the two cities. Bringing trains over the bay on a new Dumbarton Rail Bridge provides a one seat ride from San Francisco to Los Angeles as well as San Jose to Los Angeles. (Unfortunately for Oakland and most other East Bay residents, a drive to a regional station (e.g. Fremont or Livermore) or BART to San Francisco would be required.) The right of way for the Dumbarton Bridge already exists, plus such an alignment would avoid the communities most against HSR down the Peninsula. These communities also happen to be the richest and the most rich in job centers of the Peninsula. Job centers include Stanford University in Palo Alto, Google in Mountain View and many other job centers in northwest Santa Clara County. The route would go near major job centers such as Oyster Point's biotech zone, SFO, and about 2000m from Facebook's headquarters. Similar to the East Bay Branching option, service would branch here but to San Francisco instead of Oakland. The same issues of capacity and service would potentially affect this option. If enough capacity is built into the Altamont corridor (Stockton to Fremont), the branching does not pose a problem. However, in any of the branching cases, the system is inherently less efficient. If all trains could pass through both San Francisco and San Jose trains service would not necessarily be split. 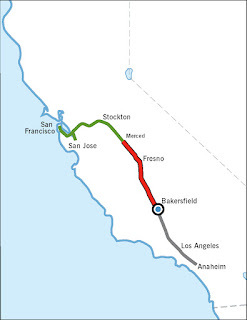 All trains will pass through the two cities once the Pacheco Pass route is built. Other advantages to Dumbarton Branching are stops at San Francisco Int'l Airport (via Millbrae Station), the opportunity to offer regional commuter rail service via Dumbarton Bridge, and a stop in Redwood City. The secondary benefits of added commuter train service, and connections to the airport could justify the cost of a new bridge over the bay. The drawbacks of this option include the cost of the Dumbarton Bridge, continued opposition from effected communities on the Peninsula (e.g. Burlingame, San Carlos, etc. ), and the previously mentioned branching challenges. 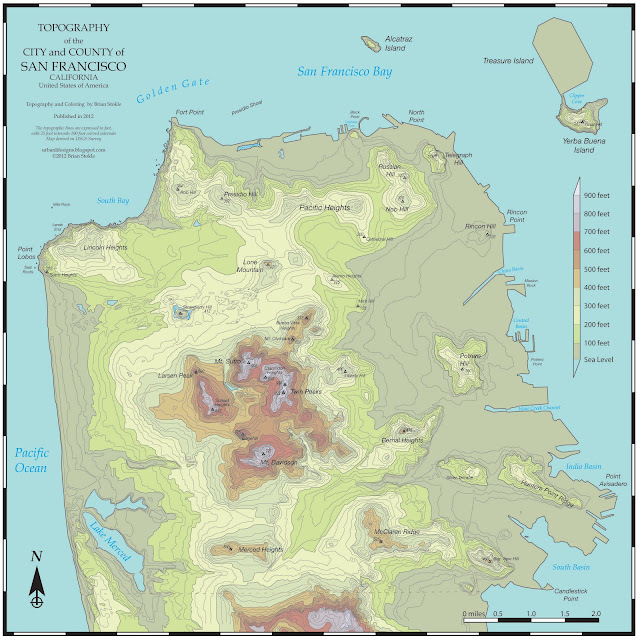 San Francisco via new Transbay Tube and to San Jose. The Transbay Trifecta Option would offer the same service to San Francisco and San Jose as the Dumbarton Branching option. What's more, it would also directly serve Oakland, and avoid the Peninsula altogether. The Tri-City Branching option allows for all three major cities to have their cake and eat it. The Peninsula would "lose" its chance for service, instead relying on connecting Caltrain service to San Jose and San Francisco to reach HSR trains. The option is clearly a cake, mostly due to the necessity of building a 2nd Transbay Tube for High Speed Trains. Although building such a tube would possibly run north of $10 billion, it would also create a plenitude of secondary benefits for regional transit. The tube could either be two bores for regular electric rail, or it could be four bores with the two added bores serving BART. Secondary benefits would include providing commuter rail service between Richmond, Berkeley and Emeryville to the many Peninsula destinations. Whether a 2 bores or 4 bores, it could open the door to subway service to San Francisco's western Sunset and Richmond districts. Other benefits include direct access to Oakland Int'l Aiport (OAK), closer access to the vast East Bay communities, who make up nearly half the region's population, and direct BART transfer stations at Union City and Coliseum. The down side to the Transbay Trifecta is the need for branching service. However, if enough capacity is available on the main line from Fremont to Stockton, branching would not be a real negative. Other disadvantages include a lack of access to SFO and Peninsula job centers. The great challenge in creating large infrastructure projects is their cost, complexity, and political challenges. Sometimes the cheapest option may be the weakest option, and waste more money than a more expensive option, in the long run. Several varying issues also make selecting a preferred alignment difficult, including problems associated with branching, the number of upgrades required in each option, and the political and community opposition or support to particular options. If the HSR tracks open in the Central Valley, and very little funding is available for local improvements, then the Delta Option is the only option due to having two to three tracks as opposed to the single track on Altamont Pass. 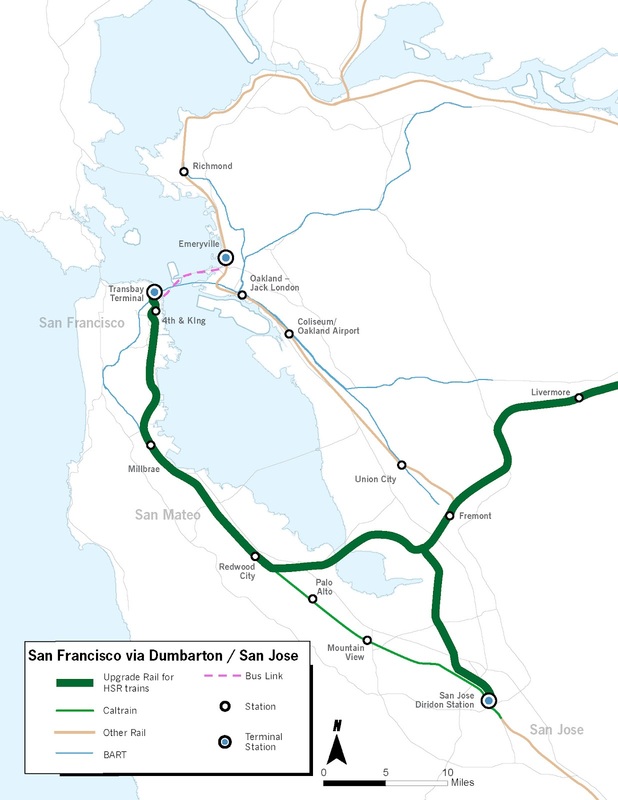 However, if Altamont Pass is upgraded to two (or three) tracks, and tunnels are built through the pass and along Niles Canyon, then the Dumbarton Option is the best option. While more expensive than the East Bay Branch option, it would provide many more opportunities for other services to thrive due to the new Dumbarton Bridge. Although the Transbay option provides virtually the same solutions, a new tube under the bay would be more costly than a new bridge. Either way, whatever option is selected, a comprehensive analysis is required. Factoring in passenger demand, weighing cost, environmental impacts, secondary benefits, and funding sources need to be conducted outside of political demands. Community imput should be solicited in this period, but not be the sole decider of whether or not an alignment can or cannot pass through a community. The new HSR system will benefit ALL of California, and the impacts upon communities must be considered. However local communities cannot have absolute veto power over deciding where such an important state project should go. Once an analysis is conducted, one or two preferred alternative should be selected and then debated in the political and community arena. After community and political analysis, it may be worth the extra money to build a second Transbay Tube due to new tunneling techniques, political disapproval of passing through Peninsula communities, and benefits to an East Bay alignment that had not been previously accounted for. Or, the Dumbarton alignment could be selected due to lower costs and a better outreach to local residents that includes them in the planning process and demonstrates that Peninsula rail improvements would benefit residents more than hurt them. 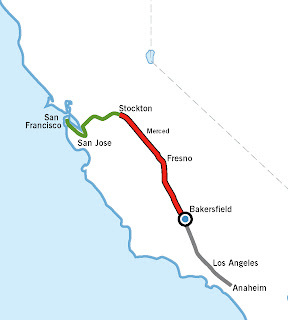 Although the CA HSR Authority has chosen the Merced to Palmdale route as its first segment, let's take a look at this choice along with the other options of building over Pacheco Pass or north to Stockton instead. Could the other options be more feasible? faster? or cheaper to build than the Tehachapi option? Although this option is no longer an "official" option, it is could end up being the first segment of high speed track that opens. While the Tehachapi segment between Bakersfield and Palmdale is completed, we should consider what kind of service could be provided in the interim.akes the longest travel time when compared to the Pacheco and Delta (Stockton) Options. As shown in the time comparison above, a one seat ride from San Francisco would take approximately 6 1/2 hours; about 1 hour longer than flying, but still 1 1/2 hours shorter than driving. Two negatives plague this option, which was originally criticized as being a train from nowhere. Whether you think a high speed train from Bakersfield to Merced is a train to nowhere is up to your point of view. 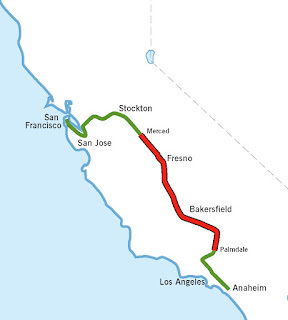 The negatives in fact are that this route would only allow one seat rides from San Francisco to Bakersfield via the Delta (not shown) without upgrades of tracks in Altamont Pass. 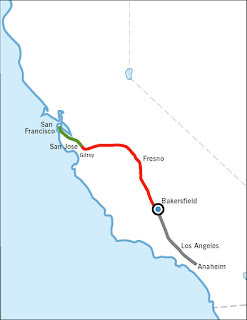 More importantly, a ride from San Francisco to Los Angeles would require a transfer from train to coach bus in Bakersfield, much like the current San Joaquin route operates. Although Amtrak coaches are generally very comfortable and efficient, the switch to a bus would require added time to change modes, and would be admittedly a letdown emotionally after traveling at 200 mph from Merced to Bakersfield. With a travel time longer than flying, and a required transfer from train to coach bus that would be politically difficult to justify, the option would likely not attract enough passengers to justify its construction, nor would it likely even pass political muster to even get built as shown. This option, although faster than the Bakersfield Option, the would have passengers taking approximately 6 hours from San Francisco to Los Angeles, which is longer compared to the Delta(Stockton) and Pacheco routes. Although the Delta (Stockton) route is 40 minutes shorter, and the Pacheco route is 60 minutes shorter, the Tehachapi route is the sole route that offers a one-seat ride from the Bay Area to Los Angeles. Trains can depart from San Francisco and San Jose, traveling at speeds close to 100 miles per hour. After Merced they would travel at the full high speed of 200 mph, and then slow to 100 mph from Palmdale into Los Angeles. What this means to the customer is that she can spend time on the train relaxing, working, or socializing with friends the majority of the journey. The Delta option would likely be the cheapest option to build, apart from the Bakersfield option. With only the flat San Joaquin Valley to pass through, no tunnels and few large bridges would be needed. In addition the route would be faster than the Tehachapi route by 40 minutes. Unfortunately, without building new tracks over Tehachapi Pass, a bus transfer would be required like the Bakersfield option. You may ask, "aren't there tracks going over Tehachapi Pass already". The answer would be yes, however the Union Pacific tracks are already at full capacity and designated exclusively for freight traffic. In addition, several segments of the pass have single track sections, and requires slow train movement due to steeper grades. Instead of building a leg between the Central Valley to Los Angeles, what would an option linking the valley to the Bay Area look like? The Pacheco option would be the fastest of the blended options, with a travel time of 5 hours. 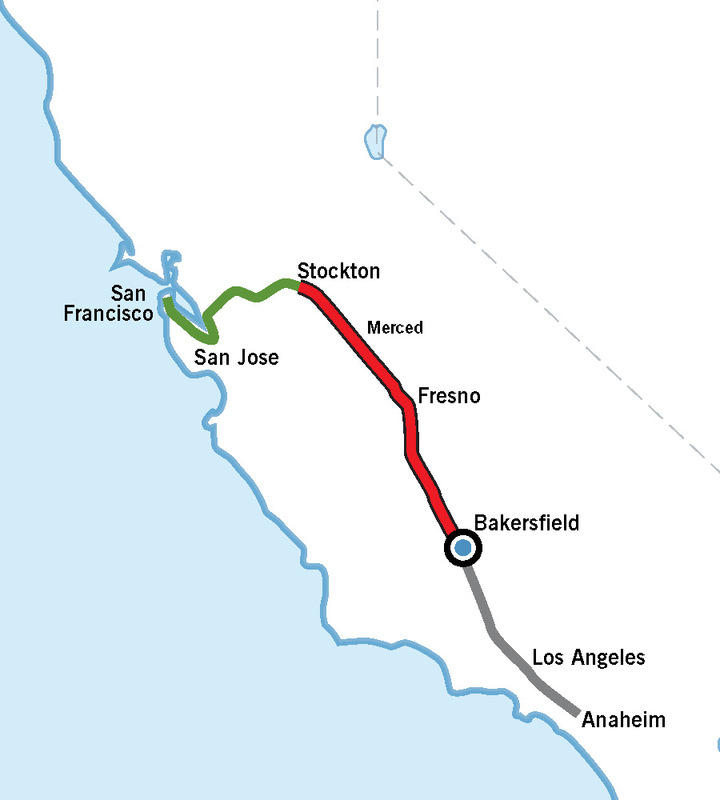 Instead of favoring travel from LA to Bakersfield and Fresno, it would favor travel from San Jose and Gilroy to Fresno and Merced. Although more expensive than the Delta Option, but likely similar in cost to the Tehachapi option due to crossing a mountain pass, a bus transfer would still be required at Bakersfield. Buses would then travel over the Grapevine and into the Los Angeles Basin. Finally, all of the options requiring a bus transfer would call for buses to travel in mixed traffic on Interstate 5, both over the pass and into greater Los Angeles. Driving in mixed traffic can slow down buses significantly considering LA's infamous traffic. Although the Grapevine is less congested, it is sometimes closed during the winter due to snowfall. The negatives of switching modes, a two seat ride instead of a one seat ride, traffic and weather all conspire to make the Pacheco, Delta and Bakersfield options inadvisable. The California High Speed Rail Authority got it right. The Tehachapi alignment is the best alignment because it is the only option that gives passengers a one seat ride. Although the Pacheco and Delta options would have a shorter travel time, they would be vulnerable to highway traffic conditions in Los Angeles. More importantly, they would require a two-seat ride. A one-seat ride's benefits are difficult to underestimate. Most people are more anxious or annoyed with transfers and waiting than they are with total travel time. To make the point with an exaggerated example, most people would take a 6 hour journey with no transfers. In contrast very few would choose a 5 hour journey that required two transfers. This happens all the time with flying. Although some trips with 2 transfers may be cheaper and take about the same time as a 1 transfer flight, most people will choose the 1 transfer flight. Urban Life Signs commends the CAHSR Authority for selecting the most realistic route from an operations route, while also keeping costs in check. Although a Delta Option would have been cheaper it would have attracted fewer passengers. With such a new form of transportation that costs so much, we cannot afford to have the first service of CA HSR fail.